I thought this bistro in the Gamla Stan (Old Town) section of Stockholm was so lovely. I didn’t know it at the time, but Under Kastanjen means “under the chestnut tree,” and that is indeed a chestnut. Would love to go back and spend more time there. 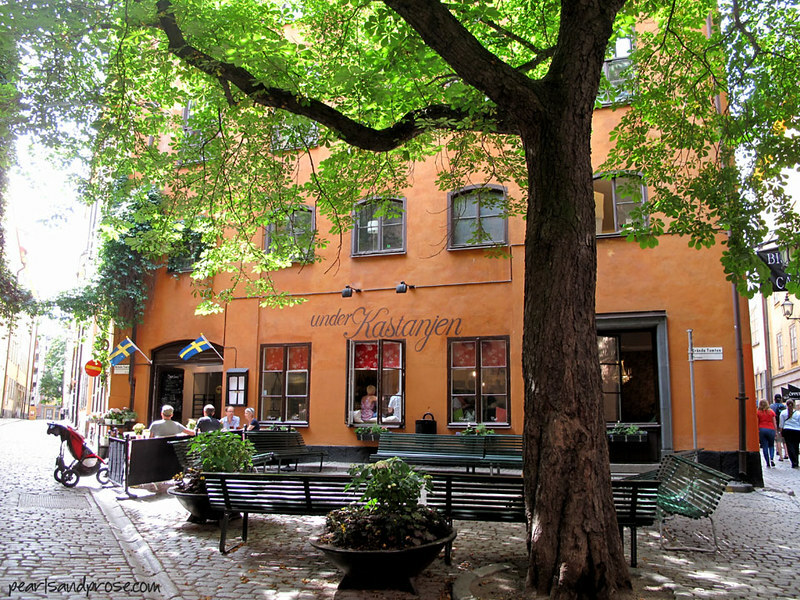 This entry was posted in photography and tagged cafe in Gamla Stan, Old Town, Stockholm, Sweden, under Kastanjen. Bookmark the permalink. Lovely picture! Great weekend to you too! It looks like a lovely place to spend a quiet moment. I love chestnuts but most of the European trees are ill and lose their leaves by July/August. Oh my, that is sad. I loved the smell of roasting chestnuts in Germany during the winter. OMG, I can’t believe you posted that, I am going there in September, on my way to Munich/ Germany, for the wedding of one of my nieces. I will have a stop over in Stockholm for 3 nights and I am excited to see this city and staying at a hostel on a ship which is near to Gamla Stan. Lucky you! Two of my favorite places in the world. I think you will really enjoy Stockholm, Cornelia. How cool! I used to frequent konditorei in Germany and loved looking at all the goodies they had there. Truly. Thanks so much for stopping by.